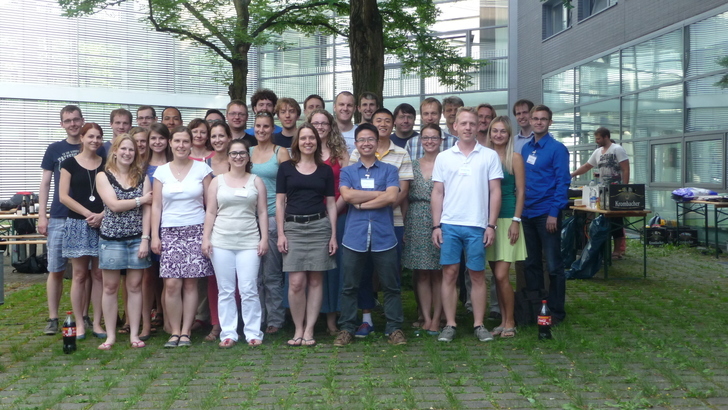 FRICO 2014 took place July 30 - August 02, 2014 at the Institute of Mathematical Optimization, Otto-von-Guericke Universität Magdeburg, Germany, hosted by the Discrete Optimization Group. FRICO 2014 is the 18th workshop in a sequence of successful meetings, see the location of previous FRICOs in the history. FRICO 2014 was very successful from our point of view and we hope you had a safe journey home. On behalf of all participants we thank the industry partners for their support and the speakers for their talks. See you in Cologne! For more pictures, have a look at the picture area. This year Marlis Bärthel got the award for the best talk at the workshop. The workshop aims to bring together young researchers (students, PhD students, postdocs) and to encourage the exchange of new ideas. The focus of the workshop is to present their own results as well as work in progress from various areas of combinatorial optimization. FRICO is intended to be a workshop in the original meaning of the word. In particular, we encourage the submission and presentation of on-going and future research (even work containing gaps and unsolved problems). Besides plenty of time between sessions, there will be a social program that allows participants to exchange ideas and have fruitful discussions. Due to a sponsoring by our partner Siemens, participation for young researchers was free of charge. Participants only had to cover their travel and accommodation expenses. Similar to previous FRICOs, we had an industry day where practioners from the industry highlighted the application of combinatorial optimization in practice.